Greetings everybody, it’s Andy Gesner and the staff from HIP Video Promo, here with a visually-appealing new clip for a sparkling pop-rock single. Great songs drive contemporary music, and Mark Davison of Nuke The Soup is a terrific songwriter. He’s a sure hand with a well-crafted melody, a fine, thought-provoking lyricist, and a composer of instantly-memorable choruses. 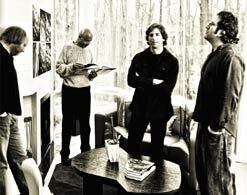 For almost ten years — and four LPs — the vehicle for Davison’s songwriting was the whip-smart Cubic Feet, a Baltimore band with a national following.Superconnector, the band’s 2001 release, won plaudits for its imaginative arrangements, its intriguing subject matter, and Davison’s poised, confident performances. Cubic Feet was an outstanding combo: versatile, ambitious, sensitive to the many nuances of Davison’s writing. But it’s no overstatement to say that Davison has assembled his best band yet — one that brings the songwriter’s vision to life in vivid color. Nuke The Soup guitarist Rennie Grant complements Davison’s own six-string with rare empathy. Bassist Mike Mennell’s imaginative parts are practically counterpoints to Davison’s inventive melodies. Brian Simms contributes scalding organ and spacey synthesizer, adding character and class. And on drums, the duties are split on the record between a genuine legend Chester Thompson (Frank Zappa, Genesis) and Keith Cronin (Pat Travers), who does the honors of laying down the beat for “Yin and Yang”. Nuke The Soup’s skills are forefront on “Yin And Yang”, the band’s latest single. It’s a semi-acoustic singalong cut, but Cronin drives it like a slice of anthemic rock. Davison’s vocals are crisp; Simms’s organ is radiant. And to suit the mildly psychedelic tone of the song, the musicians integrate a sitar into the second verse. Expertly assembled by producer Pete Solley (The Romantics, Oingo Boingo, and all four Cubic Feet albums), “Yin And Yang” is a standout cut on the multifaceted, wholly-engrossing Make Waves Not War. The years spent touring in support of Cubic Feet releases have turned Davison into a compelling concert performer. His turn at SXSW this year — supported by Simms on electric organ — drew notable press attention to the new songs. Will Davison and Nuke The Soup be coming to your town in 2010? Time will tell, but for now, you’ve got the “Yin And Yang” video to enjoy. Like the song, it’s a stealth-trippy experience: the more you’re exposed to it, the stranger and more beguiling it becomes. Davison is the star of the clip, but he shares top billing with some weird and appealing-looking settings, including a spare art gallery and a verdant glade in midsummer. He strums as he sings his lyrics of mystery and desire, looking back at the camera with a questioning gaze. Like everything else about the video, it feels completely natural — the plaintive statement of a man born to sing. We’re very excited to be working in tandem with Mark Davison to bring you the sparkling new clip. He’s been kind enough to hook us up with copies of the new Nuke The Soup release, Make Waves Not War and we’d love to hook you up with copies for your on-air giveaway needs. Don’t be shy about getting in touch to get your hands on some! If you need more info, call Andy Gesner at 732-613-1779 or e-mail us at HIPVideo@aol.com. You can also visit www.NukeTheSoup.com to find out more about Nuke The Soup.